The Great Ghost Fence (usually shortened to simply 'the Ghostfence') was an enormous shield-like wall surrounding the crater of Red Mountain. Developed to keep the Blight and Corprus monsters contained within the Red Mountain Region, it was sustained by the Tribunal's combined powers. If it had not existed, it is reasonable to assume that the Blight and Corprus would have reached all areas of Vvardenfell. It was constructed in a similar style to that of standard Temple architecture. Its pillars were able to channel the holy energies of the Tribunal and the spirits of the deceased, and convert them into a great impenetrable shield. Except for the tunnel through Kogoruhn, the only ingress point into the Red Mountain Region was at Ghostgate, although it was possible to levitate over the fence, and cliff racers were able to fly over it. Following his reawakening in 2E 882, Dagoth Ur bound himself to the Heart of Lorkhan, the source of the Tribunal's power, and proceeded to set in motion plans to create a theocracy in Morrowind based on the worship of the new-born god Akulakhan. Later that same year, Dagoth Ur and his ash vampires ambushed the Tribunal during their annual ritual bathing in the heart's power, driving them away and preventing them from restoring themselves with Kagrenac's tools. In the years that followed, while Dagoth Ur attempted to spread Corprus disease and the Blight throughout Vvardenfell from his fortress in the crater of Red Mountain, the Tribunal launched intermittent campaigns against the fortress, seeking to force access to the Heart Chamber. While some were successful, and Dagoth Ur and his kin were slain, the Heart always revived them in time. When the Tribunal realized they couldn't destroy him, they created the Ghostfence to contain the threat. They also erected the Ghostgate so that they and others would have access to Red Mountain. They stationed Ordinators of House Indoril and Buoyant Armigers alike to guard the gate. To sustain the fence, the Tribunal were required to constantly focus a portion of their power on the fence. After Dagoth Ur managed to capture two of Kagrenac's tools, Keening and Sunder in 3E 417, the Tribunal's power was severely weakened. This, combined with the increasing effort required to sustain the Ghostfence, was a direct cause of all three Tribunes becoming increasingly reclusive. Vivec was a very public figure in Morrowind until this event. After the defeat of Dagoth Ur, Red Mountain stopped spreading the Blight and conditions in the area were much the same as the rest of Vvardenfell. The Ghostfence itself remained, however the shield that it once produced was deactivated as it became unnecessary. 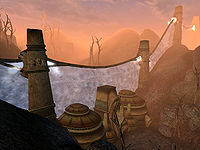 Ghostgate had not been retired and it and the Ghostfence's structure remained as a reminder of the Nerevarine and the defeat of Dagoth Ur. Ghostgate served as a rest for Pilgrims wishing to visit the Shrine of Pride and travelers passing through the area. In 4E 5, known as the Red Year, Red Mountain erupted, and obliterated the majority of settlements on Vvardenfell. The Ghostfence was almost certainly destroyed in the ensuing destruction. For game-specific information on the Ghostfence, see the Morrowind article. Esta página foi modificada pela última vez à(s) 16h47min de 27 de março de 2016.